Business owners can pursue whatever they’d like. Sometimes our businesses are the outgrowth of a pursuit. Maybe it’s fortune. Or fame. Or freedom. Or flexibility. Lots of F things to pursue. But it could be most anything. It’s the same with our careers. When we begin our career we may want certain things. Over time, it’s likely to change. And it’ll probably keep changing over time because our lives morph and grow. 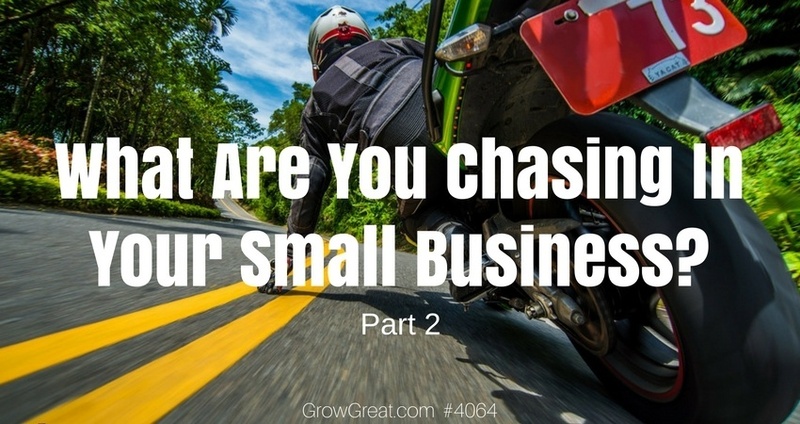 Many small business owners are chasing or pursuing things that are problems for them. Problems they’re desperately trying to solve. A common one is CASH. Another common one is CUSTOMERS. These are worthwhile and necessary. But in the context of this series of podcasts we’re concentrating on solving problems in the hopes of improving and growing our businesses. The goal is to create a business that will provide sustainable and somewhat predictable success. That means we want to create a business that can avoid chasing cash or customers. Doing it once in awhile isn’t the same as making it our way of life. Are you chasing bad habits? Ruts? Ditches? Are you chasing a false notion of how things should be? Are you chasing profits margins that just aren’t possible? Sales goals that are equally unreasonable? Dream employees that don’t exist? Today I want to talk about chasing delusions. This happens every time a business owner laments how things are today versus how they once were. That delusion is being too romantic and fanciful by practicing “good-old-days” syndrome. It presupposes that memory is accurate and that’s not always the case. Sometimes we remember how things were with greater fondness than is deserved. This happens when a business owner won’t or can’t face issues that are wrecking their company. Sometimes it’s a broken culture created by a lack of accountability. Or maybe it’s a sales process that no longer works. Or a compensation program that no longer rewards the correct performance standards. It could be anything that isn’t working, but the owner is stuck to fix it. Delusions are fueled by faulty thinking and a lack of self awareness. It’s often the reaction of a business owner who simply doesn’t know what to do so they may decide to ignore the problem in hopes it will get better. It never does. How can you stop chasing delusions? First, open yourself up to the possibility that you could be wrong. If you’re not able to even consider that you might be wrong, then you can’t be helped. But, if you’ll consider – seriously consider – that you may not be seeing things as they really are, then you’ve got the opportunity to grow. Second, surround yourself with people who can provide you different perspectives. You own the joint so you’re going to make the decisions, not them. But if you can find a way to put others around you who care about helping you grow, then you’ll be wiser for it. These should be people capable of the task. You don’t go to a dentist when you break your arm. Surround yourself with appropriate people. This is difficult because it takes effort and time. You can’t wait until you’re in trouble to start looking for good company. Most of us don’t have or take the time to join ourselves with people who can serve us until we find ourselves suddenly in need (and that too often means we’re in dire straits). Business owners need the wise counsel of other business owners. Buddies won’t do the job. Family sure won’t do the job. You need people with whom you feel safe, and people who can actually provide value as you consider what to do. That means you need peers – people more of less like you. It doesn’t matter if they have your personality traits, or if they live in the same city, or if they cheer for the same football teams. What matters is that they can relate to you and where you are — because you share experiences as business owners. Third, you need the conversation to stay on point if you’re going to derive the benefit. It’s easy for us to engage in “kick-the-ball-around” kinds of conversations where a lot of things get discussed, but where we never quite drill down to the crux of the matter. We all need somebody who will help us keep moving the conversation forward in a positive meaningful way so we can gain some clarity. Often times, the conversation just muddies up the water more. The people who surround us matter, but so does the focus of the dialogue. Lastly, we need accountability. The people who are helping us should be able and ready to hold us accountable for what we decide. Talk is always cheaper than action. And it’s always easier to talk than it is to act. Your best intentions as a business owner don’t matter. What does matter is what you actually do. It’s about performance. Most notably your performance as a business owner. You’re accustomed to holding others accountable. Subjecting yourself to it may be a harder chore, but worthwhile. In the ROI world you occupy, you know it. Be courageous enough to accept it.